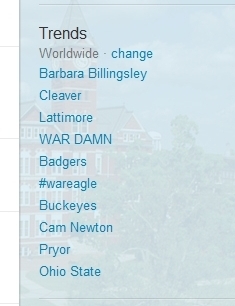 “Auburn Tigers“, “War Damn Eagle“, and “Cam Newton” (which supposedly hit #4 world freaking wide) were trending topics on Twitter this weekend, thanks in part, I’m sure, to Auburn fans tweeting about their topic trending trendiness. Justin was one of those fans. And around midnight Saturday, he took some screens shots for posterity and for cultural analysis. 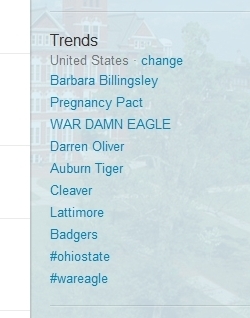 Unfortunately, that Auburn victories result in very purposefully conceived Auburn babies doesn’t really tell us anything we didn’t already know.